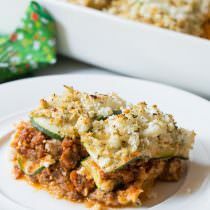 After many attempts, I’m finally ready to share The Best Paleo Lasagna we’ve ever made. 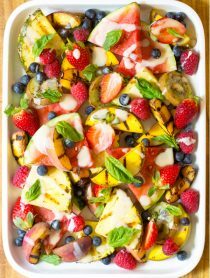 Soooo… You love pasta and heavy comfort foods, but are trying to stick to a grain-free dairy-free paleo diet? Honestly, I have a hard time sticking to any diet for the long haul. However, our family will go on a paleo diet “cleanse” on occasional after a season of excessively naughty eating. This helps us get back on track and make better food choices, at least for a while. What usually happens is that we will eat lean protein and salad (or roasted veggies) for the first few days, then around day 4-5 I start getting scornful looks when the kids come to the dinner table. This is the time I start getting artsy with my paleo recipes. 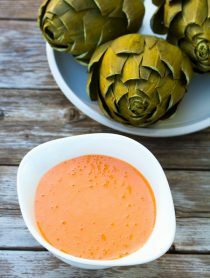 It can take a little creativity to mimic foods the kids love, without grains and dairy. Some recipes have been more successful than others. 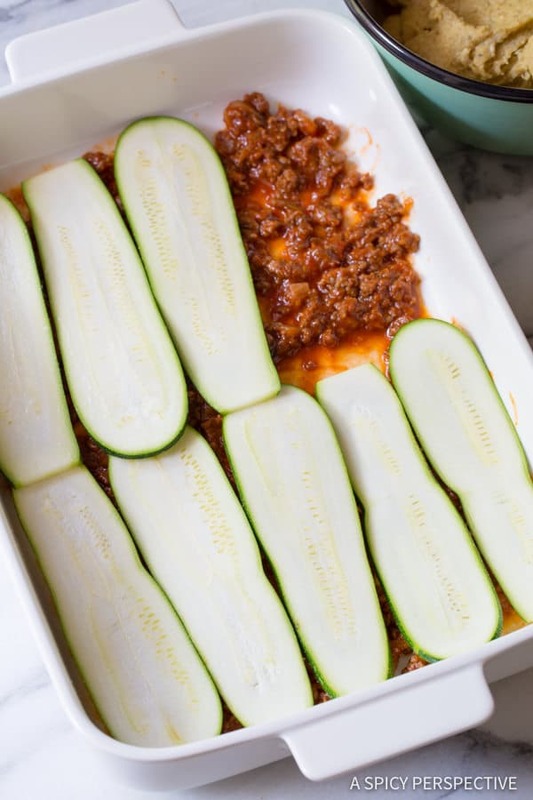 For The Best Paleo Lasagna, The meat sauce and noodles weren’t the issue. 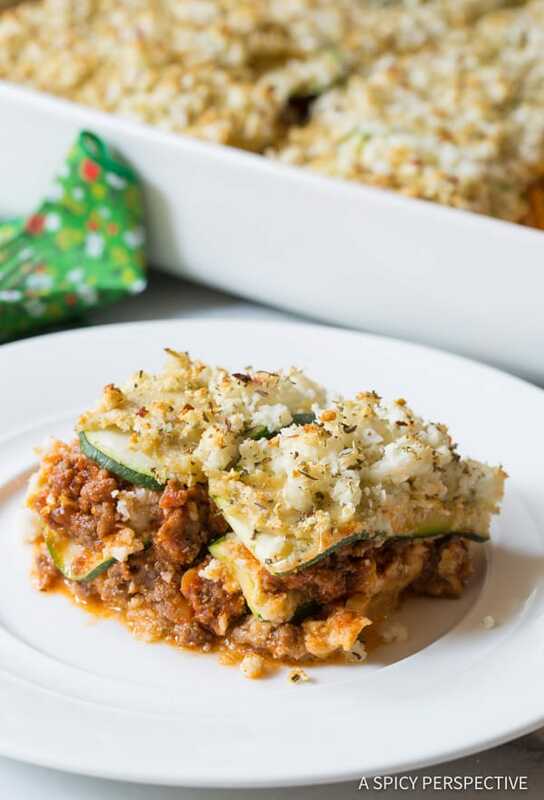 Zucchini makes a marvelous noodle substitute when baked into the lasagna layers. I decided to make a “cashew cheese spread” which is essentially fresh-made cashew butter with savory seasoning. No, it’s not cheese and doesn’t taste like cheese. Let’s be clear here. However, it does offer a creamy quality, rich flavor, and salty nutty essence the way cheese does. 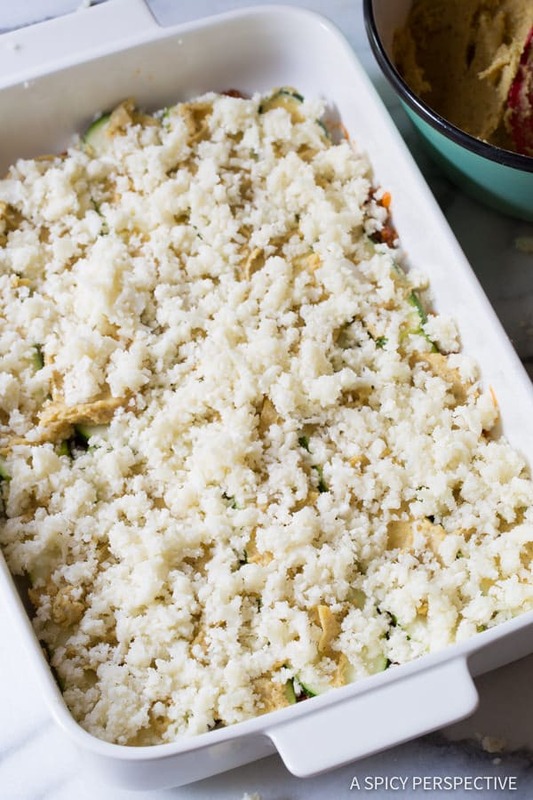 Then I spread finely chopped cauliflower over the top of the cashew cheese spread to mimic the rustic texture of ricotta or cottage cheese, that you find in many lasagna recipes. 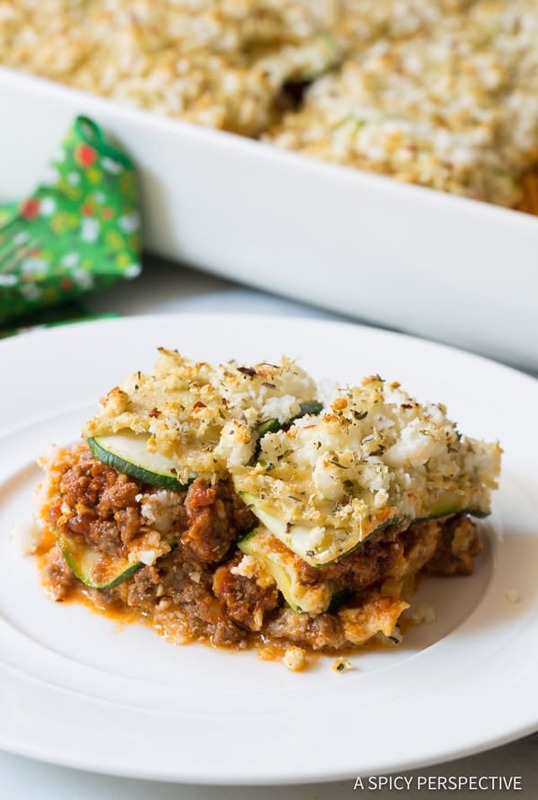 After baking three layers of meat sauce, zucchini noodles, and two cheese substitutes, I had a grain-free, dairy-free paleo lasagna recipe that almost made me teary-eyed with delight! 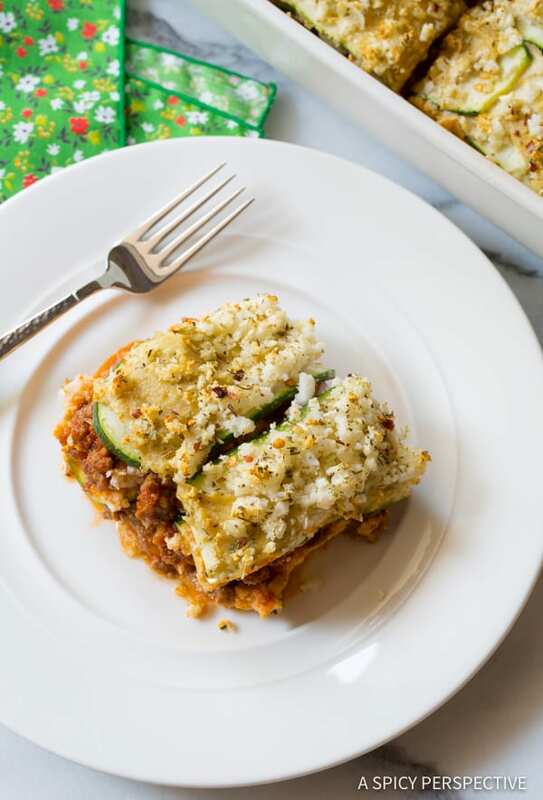 Not only is “The Best Paleo Lasagna” delicious in its own right, it has the flavor, texture, and overall essence of traditional meat lasagna. 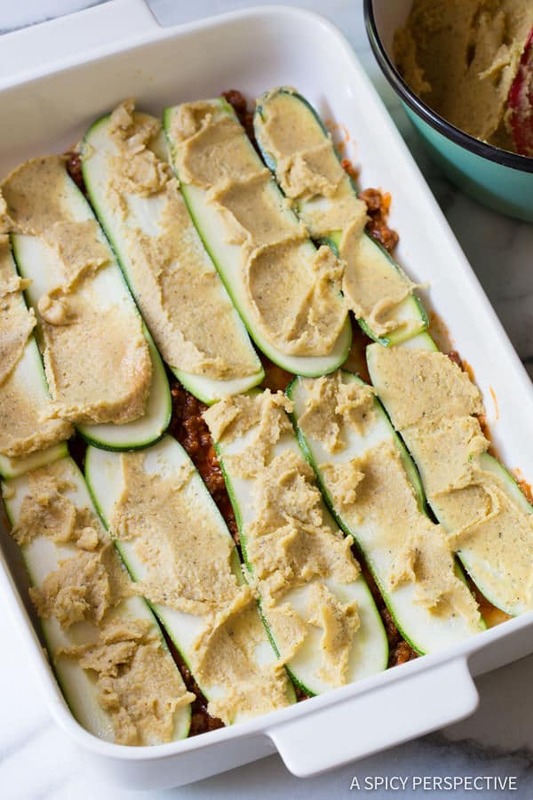 The Best Paleo Lasagna Recipe. Rich, zesty, and full of flavor without the traditional pasta and cheese. 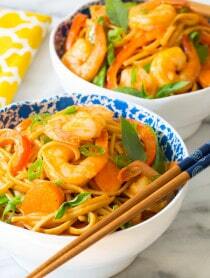 This recipe is fabulous for those on a paleo diet. Preheat the oven to 350 degrees F. Place the ground beef and pork sausage in a large sauce pot over medium heat. Brown the meat, breaking into small pieces with a wooden spoon. Once it’s mostly cooked, move the ground meat to the side of the pan and add the chopped onions and garlic. Saute for 2-3 minutes, then mix into the ground meat and saute another 2 minutes. Pour the marinara into the pot. Taste, then salt and pepper as needed. Turn off the heat. Next cut the cauliflower into chunks and place it in the food processor with 1/2 teaspoon salt. Pulse until the cauliflower is broken up into small rice-sized pieces. Dump the cauliflower out onto a paper towel to allow some of the moisture to be drawn out. 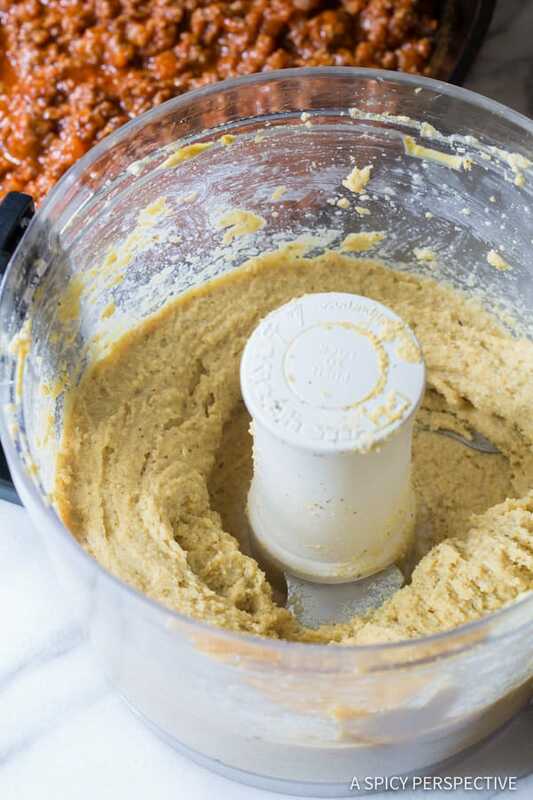 Wipe out the food processor before making the cashew “cheese.” Add the cashews and all other ingredients. Then turn the food processor on and churn until the mixture is smooth and pasty. Cut the zucchini lengthwise into thin strips, about 1 millimeter wide. It’s easiest to do this with a mandolin slicer. These will be the noodles. 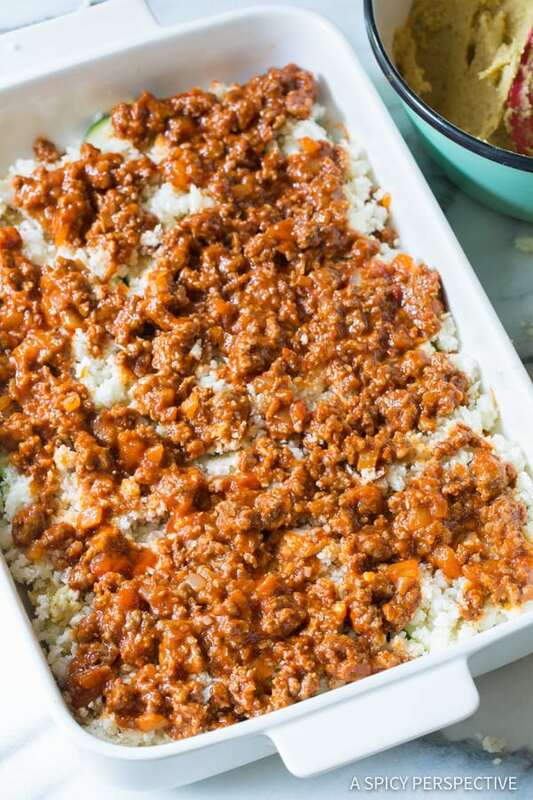 Assemble the lasagna: Spread one-third of the meat sauce over the bottom of a 9 X 13 inch baking dish. Cover it in a single layer of zucchini noodles. Then spread one-third of the cashew cheese over the zucchini noodles. Sprinkle one-third of the ground cauliflower over the cashew cheese. Repeat two more times, creating three complete layers. Bake for 30 minutes, until the sides are bubbling and the cauliflower on top starts to toast. Cut and serve warm. 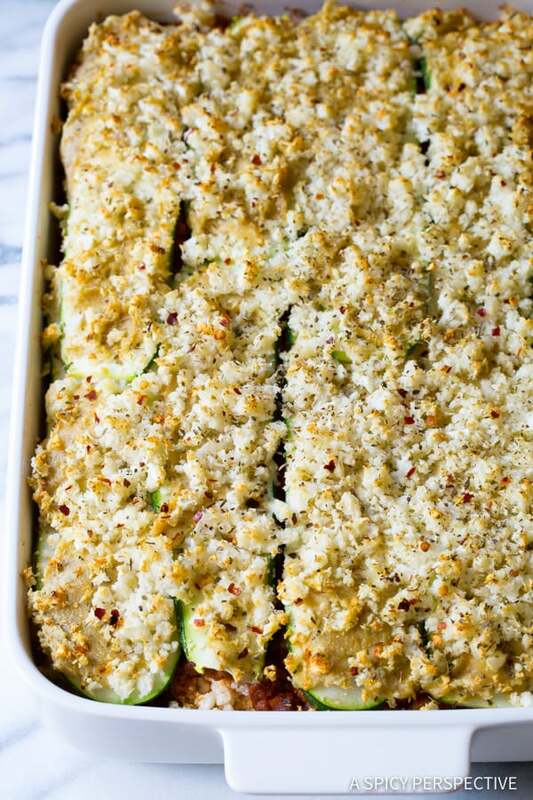 NOTE: It can be easier to spread the cashew cheese on the zucchini noodles before placing them in the baking dish. A brilliant idea for those who have intolerances or restrictions! Great way to get veggies in, too! This is amazing! Seriously SO great for those with dietary restrictions that still crave comfort food! This looks like a great dinner idea!! Looks like a great comfort meal!